Even if, unlike me, you are not a confirmed Solar System freak, you may find yourself drawn back to the local neighborhood this time of year. If you are afflicted with light pollution at home but still want to observe, the Moon and planets are more fruitful subjects by far than the dim galaxies of spring. Especially given the season’s inevitable haze and humidity. After a while, some of you may even begin to dream of capturing images of Luna and her sister worlds. So what do you need to get good images of the Moon and planets? Well, you need a camera, and you need a computer and software. But those are not the main requirements. What you really need and what is hardest for some folks to obtain is good seeing. Good atmospheric steadiness. The more I observe and photograph the Solar System, the more I’ve come to believe that that is not just an important thing, it’s almost the only thing and is much more important than the pedigree of the scope and camera. Which doesn’t mean you can't produce pleasing images if you live someplace that's always under the Jet-stream, just that there is a limit to what you can expect. Keep in mind, though, that almost all places have periods of good seeing. Watch the weather and the Clear Sky Clock and be prepared to take advantage of the steady nights you do get. Another tip? The conventional wisdom is that you should wait till your target is high above the horizon before shooting it. Sometimes that's true, but sometimes not. There've been times that my steadiest conditions have come not when the Moon or Jupe is high, but shortly after sunset. There is a brief window just after dark when the seeing settles magically even on poor nights. The trick is waiting for it to get dark enough to provide good contrast, but not so dark that the evening’s punk seeing sets in. Finally, think "thermal equalization." Set your scope out at least an hour before beginning work (but don't expose it to the Sun). If your telescope is of a design that can benefit from circulating air in the tube, think about setting up a fan system (like the commercial CAT Cooler). If you live in an area where temperature differentials are high, even putting the scope out an hour before the run may not help. A fan can help. Also, if your temperatures are dropping steadily throughout the evening, a fan system can allow your optics keep up. But, yes, you need gear. Starting with a camera. What do you want? Modern webcam-like “planetary” cameras such as the CMOS ZWO cams are best. They are sensitive and they have small pixels and a high frame rate that will provide you with plenty of stills for stacking after even short exposure sequences. The ZWOs are also surprisingly inexpensive, with the cam I use, the ZWO ASI120MC costing less than 300 dollars. You can go more expensive, both with ZWO and with other bands, like the Imaging Source cameras, but you can go cheaper, too. The truth is, some of my best shots over the years have been with humble webcams: Quickcams, Toucams, and the SAC 7B modified webcam. The main drawbacks of ‘em? More noise than modern cameras, and a frame rate that maxed out at about 10fps (the ZWO can clock off 70fps on Jupiter). However, since you can use the most hoary old Quickcam with modern software like FireCapture, it's likely you will be able to do better with a simple webcam today than I was able to do a dozen years ago, and I am still proud of some of the shots I got back then. Hows about DSLRs? They can work for full disk shots of the Moon without doubt. For high resolution close-ups? Maybe. If your camera features a video mode (most all do now), and especially if it allows you to “crop” the field, to image a small section of the frame, one can serve. You will need a software application to convert the camera’s (typically) mpeg video to the .avi format that stacking programs can use. I've seen very credible shots with DSLRs, but admittedly not as good as those done with planet-cams under similar conditions. Finally, I hear folks who, like me, are Mallincam users and who wonder whether those sensitive deep sky video cameras can be used for the planets. The answer is a qualified “yes.” You will need a frame grabber, a widget that converts incoming composite or Super VHS video from the Mallincam into a digital .avi file (I use an inexpensive Dazzle frame grabber to do that), and your results will not equal the planet-cams, but if you’ve got a Mallincam, try it. Likely you will be thrilled with your initial results. Is a digital camera always best for the Solar System? Heretofore, that’s what I've believed, but I understand that Mallincam is coming out with a new Solar System (video) camera that will knock your socks off. I've heard a little about it from testers, and what I've heard is impressive. You can see a shot with the prototype here. If you are using a color camera, you will need an accessory for your cam, an IR block filter. Electronic cameras are very sensitive to the red end of the spectrum, and unless you block some of it, your pictures will be strongly pink in color and hard to color balance. The ZWO cams come with IR filters, but if your camera doesn't, these filters are cheap and easily available. “But Uncle Rod, my webcam already has an IR block filter. When I look down at the chip I can see there’s a color filter over it.” Yes, Skeezix, most webcams come with built-in IR filters, but they are just cheap and optically poor pieces of acetate. Do yourself a favor and remove the built-in filter (instructions for doing so can be found on the web) and use a nice 1.25-inch glass filter instead. If you are using a webcam, you need to remove its lens (useless for our purposes) and provide it with a 1.25-inch nosepiece so you can insert the camera into a Barlow or focuser. Somewhat amazingly, you can still buy nosepieces that thread onto Quickcams and Toucams. These nosepieces are threaded for filters and make using an IR blocker easy. Doing a Google on “webcam telescope adapter,” will turn one up, but I can tell you that I have found them for sale on eBay recently. Back in the day, we used to hot glue 35mm film canisters onto our webcams to make a nosepiece, but I suspect 35mm film canisters are harder to come by these days than webcam adapters. What’s right behind a camera in necessity? It’s, as you’ve heard me say before when I’ve discussed high resolution Solar System work, a flip mirror. Wut’s they-at? It’s a special sort of star diagonal with a movable mirror and a port on the rear for your camera. You put an eyepiece in the eyepiece holder, flip the mirror up to send the images to that eyepiece, center your target in the ocular, focus, flip the mirror down to send the light to the camera, and the target should be in the frame and at least roughly focused. Flip mirrors are easy to use with most refractors and with all moving mirror focusing scopes like SCTs and MCTs. They can also be used with Newtonians, though backfocus issues may arise with those telescopes. Do you really need such a thing? You’re darned tootin' you do. I found that out 20 years ago, the first time I mounted a small-chip video camera—well, not really “small chip,” more like “small vidicon tube”—on my C8 and aimed at the Moon. Or tried to. At f/20, a reasonable focal ratio for lunar imaging, I had a heck of a time getting the Moon in the frame. Planets were even harder. When I’d had enough frustration, I glommed onto a Meade 1.25-inch flip mirror (you don’t need a 2-inch for the Moon and planets). Even if your mount is equipped with an accurate goto system, you can’t always depend on it landing Jupiter on a tiny sensor at long focal lengths. Get a flip mirror. Where do you get one? 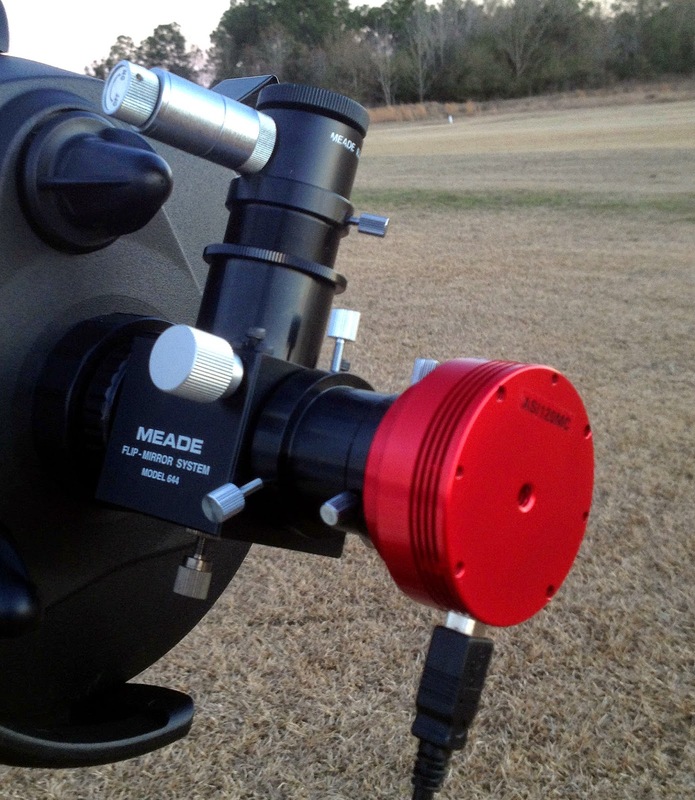 For years, the best choice for flip mirrors was Meade. They were importing a very nicely made but inexpensive Japanese job, which is what I’ve got. Not surprisingly if you’ve followed the fortunes of Big Blue, the flip mirror, along with all the company’s other imaging gear, is long gone. And, unfortunately, there are not many flip mirrors for sale by anybody else these days. The reason for the scarcity of flippers is that a large part of the audience for 'em used to be deep sky imagers with CCD cameras with small sensors. Today, even the least expensive CCDs have relatively large sensors, and it’s hard not to get your target on the big chip of an APS-C or full frame DSLR. There’s just not much demand for flip mirrors anymore. You can still get these devices, however. A Vixen unit is widely available, and so is one from Agena Astro. Unfortunately for you SCT fans, however, both of these are 1.25-inch format units. You’ll have to insert them into a visual back. 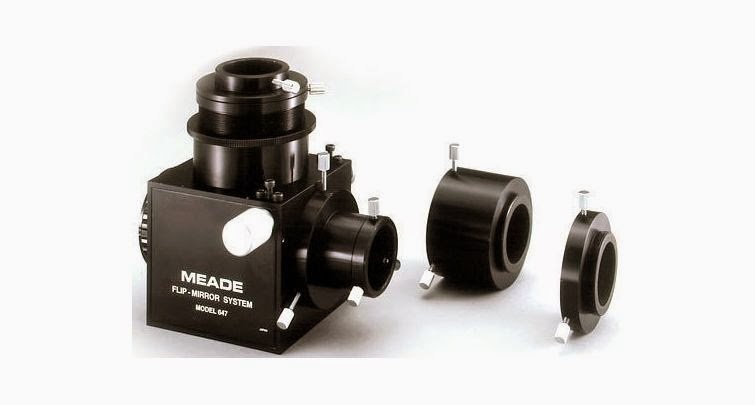 The wonderful old Meade flip mirrors were equipped with threaded rings and would screw right onto an SCT’s rear port, no additional adapters needed. You might see if you can find a used one (the 2-inch Meade flip mirror will work well, too). You could just plug your camera into the flip-mirror, but even with an f/10 SCT you wouldn’t get much image scale. A Barlow normally goes before the camera. I find that a 2x Barlow, which yields a final focal ratio of a smidge over f/20 with a C8, is perfect for my SCT on the Moon, Jupiter, and Saturn much of the time. Which Barlow? We are living in something of a golden age when it comes to Barlow lenses. It’s been a long time since I’ve seen a bad one. Some folks swear by the TeleVue Powermate “corrected Barlows,” but I’ve gotten incredibly good results with an old Orion Shorty 2x and a 3x ED Barlow I got from Owl Astronomy at the Cherry Springs Star Party years ago. Didn't pay much for either, and they deliver sharp pictures, so what more can I say? You’ve got your subject framed, but now you need focus. Naturally, when you are shooting a detail-laden planet at f/20 or f/30, you need focus as good as you can get it. You don't get it by walking out to the scope, twitching the focuser, and walking back to look at the screen. You don't even do it by positioning the monitor so you can see it as you focus. Even with a sturdy mounting, touching the focuser is likely to cause vibration at high magnifications. Hands off. You do that with motorized focusing. The choice of motor and controller is up to you, but I’ve found that a simple focus hand controller with buttons works fine; I haven’t felt moved to use any kind of a computer app to control focus. Anyhow, it is just so nice to sit at the computer and focus without touching the scope or taking my eyes from the screen. SCT users face a challenge beyond vibration when focusing. Because SCTs move the telescope’s primary mirror to focus, images move across the field during focusing due to play between the primary and the baffle tube it slides on. Visually, the movement usually isn't enough to be annoying. At f/30 on a small sensor, however, focusing may move your target completely out of the frame, which is not cool. The cure for this “focus shift” is to mount a Crayford focuser on the scope's rear cell and focus by moving the camera instead of the primary. Add a motor to the Crayford, and SCT focusing is as good as it gets. The main drawback to this system is that it's fairly costly depending on the quality of the Crayford you choose, and may not be useful for deep sky imaging or visual use due to back focus issues with some cameras and eyepieces. Me? I don’t use a Crayford. My three most-used SCTs have focus shift that’s small enough not to be too problematical. I still want motofocus, however, so I use a JMI Motofocus. This accessory, one of the first developed by Jim’s Mobile in the earliest go-go days of the SCT, is a motor that snaps over the SCT’s normal focus knob (actually over a furnished replacement knob). It’s equipped with a hand control, and extension cables are easily available to let you focus seated at the computer. If your scope’s focus shift is not too bad, I can swear by the efficacy of the simple and relatively inexpensive Motofocus. Now for a computer. How much computer? PC? Mac? Luckily, just about any reasonably current machine will work for shooting planetary .avis. Plenty of hard drive capacity is nice, but a superfast Alienware machine just isn’t a necessity. My garden-variety Toshiba laptop, which is about four years old now, works just ducky. As is usually the case, the main determinant as to which type of computer you choose, Apple or PC, is your choice of software. At this time, I’m still leaning toward PC, solely because of a breakthrough program, FireCapture. That does not mean that there are not capable Apple programs for image acquisition, however. Finally, you’ll need a cable to connect your camera to your PC. Which cable? What you need depends on the connector on your camera, but check out the offerings of Tether Tools. Their cables are mainly for DSLRs, but they have USB cords designed to fit the Point Grey cameras, too, and may be able to furnish one with the USB connector your cam requires. They have just what you want: hefty yet flexible cables that are colored a bright orange to help keep you from tripping over 'em. That’s the hardware side. Just as important is the software. When we are talking PCs, mostly what you see everybody using today for camera control is the above mentioned freeware program, FireCapture, written by Torsten Edelmann. It’s not the only PC program aimed at imaging with webcams and planetary cameras, but many imagers will opine it is the best. What if for some reason you don’t want, to use FireCapture? There are alternatives. If you are a Keep It Simple Stupid person, and there is something to be said for the KISS principle, you might like Sharpcap. Robin Glover’s freeware is small, fast, not demanding of computer horsepower, and will operate just about any webcam/planet-cam. My experience is that when nothing else works, when your off-the-beaten-path camera crashes every program you’ve tried, Sharpcap will get ‘er done. A sentimental favorite of mine is K3CCD Tools. This is the program I used to capture Mars in 2003 after tearing my hair out trying to figure out the program that came with my SAC 7B, Astrovideo. K3CCD has a lot going for it, including compatibility with many webcam and webcam like cameras (any VFW or WDM camera and a few others beside, like the Lumineras). K3 also can do long exposure imaging with modified webcams, and can even be used to measure double star separation and position angles. Downsides to good, old K3CCD? Well, it’s not freeware; it’s 50 bucks for version 3. That’s not bad, but the elephant in the living room is that the free FireCapture is more capable and supports modern cameras. More fatally, the author of K3, Peter Katreniak, appears to have stopped developing his program and doesn't appear much interested in it anymore. It’s to the point that people needing a new registration number (you have to have a new one when you install the program on a new computer) have a hard time getting one. It’s been seven years since the program was updated. Apple weenie? I don’t blame you for being one. I am going through one of those spells when I am seriously considering switching myself. What is out there for image acquisition? I am hardly an expert about that, but the name I keep hearing is Keith’s AstroImager. I am sure y’all Apple Mavens can rattle off a bunch more, however, and I hope y’all will do so in the comments section. Once you have your movie files, your .avi sequences of the Moon or a planet, on the hard drive, the fun (and work) has just begun. You will then need to select the best frames from your .avi and stack them into a final, finished image. The beauty of the thing is that that is now automated. Trying to sort through hundreds of images manually and stack them by hand with Photoshop is a thing of the distant past. PC-wise, one name still trumps ‘em all, Registax by Cor Berrevoets, now in its 6th edition. 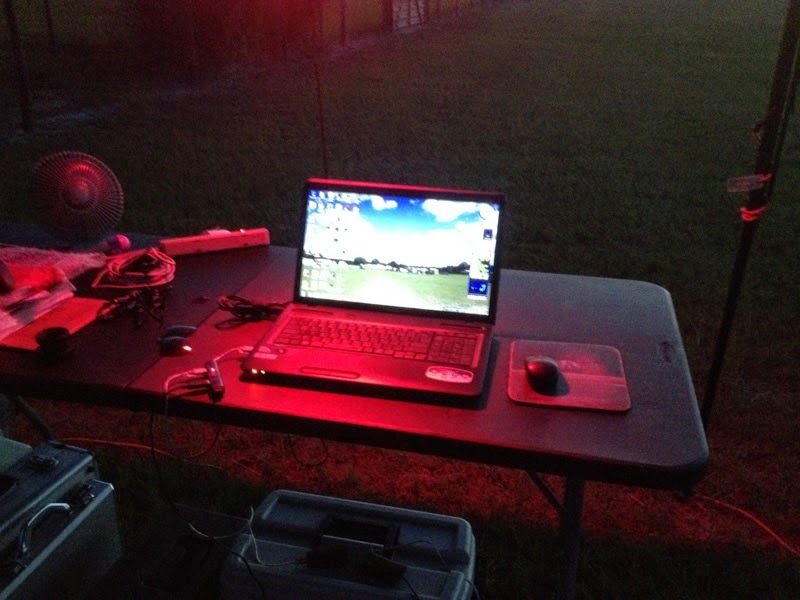 This was, as much as the webcam, what powered the planetary imaging revolution in amateur astronomy. There’d been a similar application before Registax, Astrostack, but it was not quite all there. Registax was, and made it possible to produce planetary images better than those done with the largest ground based telescopes just a few years before. Registax is a great thing, but it is not the only thing. What you hear talked about a lot on the planetary imaging boards today is a similar application, Emil Kraaikamp’s AutoStakkert. Is it a huge improvement over Registax? In my opinion, no. But its stacked images are somewhat better. And “somewhat” can be important when you are trying to wring every last bit of detail out of a planet. Only caveat? Even if you switch to AutoStakkert for stacking, you’ll still need Registax on your hard drive. 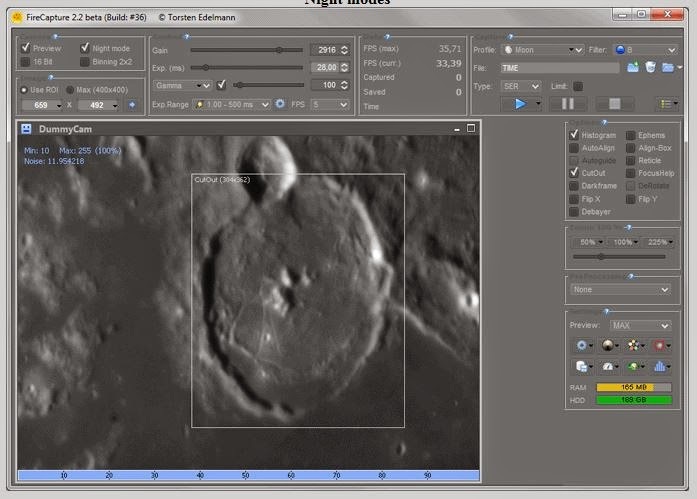 Nothing is better for bringing out detail than Registax’s wavelet filters, and AutoStakkert lacks a similar tool. For Apple? Again, I am depending on y’all to help me out here. What I hear mentioned most for Apple image stacking, however, is another application from Keith Wiley, Keith’s Image Stacker. Is it the best? What else is there? Dunno. That’s why I need the help of you Apple troops in the comments section. Camera? Check! PC? Check! Software? Check! Anything else? Oh. Yeah, a telescope. Actually, that is the easy part. Does your scope produce a pleasing visual image of Jupiter? One with a fair amount of detail? If so, you can be assured it will produce a decent image of the planet too. Not that all scopes are created equal for planetary imaging. You want one with a decent drive. It must be able to keep the highly magnified image of a planet on the small chip of a planet-cam. What should the focal length be? About 4000mm of focal length is where you start. You can Barlow any scope to get a large enough image, but it’s easier to start with a longer focal length and not have to worry about high power Barlows, stacking Barlows, and stuff like that. What most serious planetary imagers, people like Chris Go and Damian Peach, are using is the good, old SCT. Lotsa focal length. Even the inexpensive models have drives up to the task. It’s easy to mount a camera on one, and easy to set one up for motofocus. The short tube keeps the shakes down at high power. All things being equal, if I had access to an SCT, especially one of at least 8-inches of aperture, that’s what I’d use. Which is not to say other scopes can’t do well. I produced some fine Mars images in ’03 with my humble Synta 8-inch f/5 Newtonian. It would be an understatement to say I was shocked and saddened when I was informed of the death of one of our most prominent amateur astronomers, Phil Wheery of NOVAC, a chief organizers of one of my favorite astro-events of all time, The Almost Heaven Star Party. I really don’t feel able to say much more at this time; I’m just too shaken. All I can do is offer my condolences to Phil’s family and friends (there were many). He will indeed be missed. Agreed. Bahtinov mask at a star, then slew to Jupiter. I use finder+qhy5 as an electronic finder and it puts Jupiter in my 3xxx mm scope+barlow fov. Thanks again for the blog. I am a frequent reader and you have helped me to select the equipment I use today. - Windows software can be used on the Mac with Parallels Desktop. I use Registax 6 on a Windows-7 virtual machine. For me, Windows is more stable in Parallels than on a native PC. - Just to mention that the Sony NEX 5R is an interesting option for planetary imaging. It has video and is very sensitive. At 1600 ASA you image Jupiter at 25 fps in a Celestron C6 and about 4000 mm focal length. - Why not using eyepiece projection? The eyepiece has to be placed between the SC to T2 adapter and the camara's sensor. Using the 25 mm plössl which is shipped with a Celestron C6 SCT gives acceptable results. The focal length must be about 4000 mm, considering Jupiter's size on the NEX 5R sensor (APS-C). I hope these comments add value to your blog! Greetings from the Principality of Andorra (Europe). Thanks for the excellent comments, Alexander. Since I'm considering going Mac, they were valuable to me. I have a Mac, I don't use windows on my mac. Just seems silly to have a mac, then use windows.